I am both embarrassed and a little proud that I’ve had to abandon two boats in my life. To save face, I must add that neither vessel belonged to me, nor was under my command; still, the emotions involved are strong. The embarrassment, of course, is easy to understand. Any time you abandon ship there is a feeling that you have failed. Whatever mishap has occurred, you will always wish you had mastered it and brought your vessel safely through it. My first lost boat was rather grand and antique, a classic 78ft Alden schooner—once a queen of the Navy’s WWII Corsair fleet—that was 60 years old when I sailed on her. All of our voyage from Florida to Spain was a slowly unraveling catastrophe, and I don’t think anyone involved was too surprised when we finally lost the old girl in a river on Spain’s southwest coast. Our pride, in that case, stemmed from the fact that we managed to get the boat across the Atlantic at all, given how fragile and exhausted she was. She nearly sank from under us during our first attempt to reach Bermuda, and the yard crew back in Florida who helped us fix her up afterward only laughed when we set out for Spain again. Unfortunately, our embarrassment was augmented by the fact that we ultimately lost her by running aground. To be frank, she did not sink exactly but instead failed to float again, and the evacuation amounted to nothing more than a dinghy ride to a nearby dock. I never had a chance to revisit that wreck, but a fellow shipmate did and later showed me photos. Though these were taken only a few months after the abandonment, I was shocked and saddened by how degraded the boat had already become. I told the story of my second mishap three years ago in this magazine (Abandoning Be Good Too, May 2014), a more exciting tale for sure. This was a winter delivery on a brand-new 42ft catamaran where almost everything that possibly could go wrong, did. We were taking on water through so many leaks it was impossible to find them all. We had no electrical power and no matter what we did, the boat would only steer in circles. We drifted for three days trying to solve these problems, paralyzed more than 300 miles offshore, and in the end called the Coast Guard for help. The fact that they came to get us with a helicopter only added to the drama. In this case, our embarrassment was compounded by the advent of the Internet, as the online peanut gallery instantly rose up to berate us as incompetent after we stepped ashore. Still, most of their critiques were baseless and we did take pride in the fact that we’d kept our heads and acted deliberately throughout our adventure. I wasn’t sure if our catamaran would sink or not, but after months passed with no sighting, I assumed she must have. Thus I was surprised—almost ecstatic at first, but also skeptical—when, three years later, I received a note from a fellow on the island of South Uist in the Scottish Outer Hebrides. Attached were photos of an inverted twin-hulled wreck, covered in gooseneck barnacles that had a distinctive pair of reverse “wave-piercing” bows. Could this be our boat? 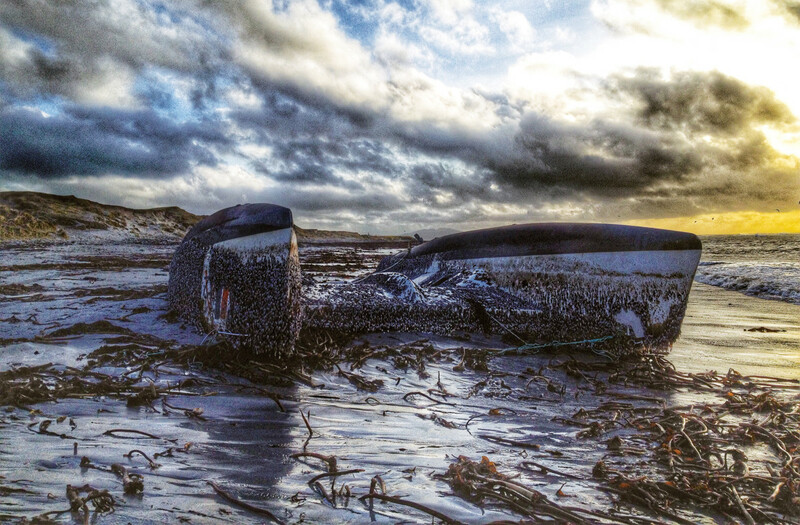 I exchanged more notes with my Scottish friend, received more photographs and finally there came one with inconvertible evidence: the name on her transom, upside down, half buried in the sand, made visible through barnacles that had been scraped away. What an odyssey! A drift of more than 3,000 miles, from near the Virginia coast all the way to Scotland. And what a range of emotion it has evoked in me. There is the simple joy of discovery, of learning the end of the story. There is anger when I study the photos and recognize the open wound of the escape hatch in the starboard hull, which refused to stay shut during the gale we endured. There is all the embarrassment and pride, remembered and revisited. But mostly I just feel sad. For even if you don’t know their story, the decrepit bones of any lost vessel will always deserve mourning and respect.